Legacy’s first 14U tournament of 2014 was the McGregor Cup, Championship East division, in Newmarket. 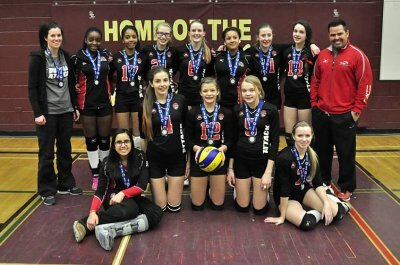 Legacy played strong all day, winning every set of every match vs. Aurora Storm Twister and Markham Stingers Black in pool play, STVC Synergy in the quarter-finals, and Markham Stingers in the semi-finals. And then …Legacy found themselves in the Gold Medal match facing, again, just like the last tournament, Scarborough Titans Tektonics. Legacy came out impressively taking the first set 25-21, then conceded the second set 15-25, and again had to battle for the gold medal in a white-knuckling third set. Tektonics squeaked out a close win 15-12 to take the gold, leaving Legacy with another Silver medal, but with smiles on their faces knowing how well they played all day and how close they came to the gold.